We all know that employee engagement is important and can bring multiple benefits. But how many organisations really do it well? 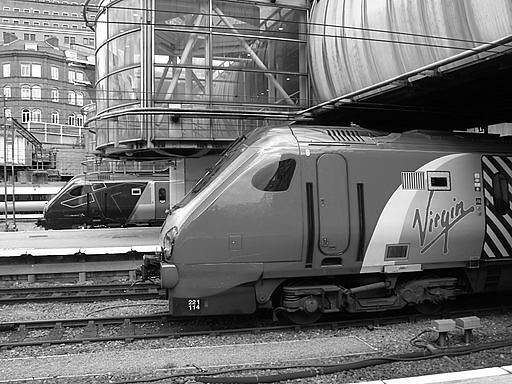 A recent visit to Virgin Trains opened the eyes of one comms professional. I was lucky enough to get an invite to the opening of the new First Class Lounge at Virgin Trains, Euston. I thought it would be rude not to turn up and there were canapés and cocktails in the offing. Working for local government, it’s not a regular occurrence for such places to be graced with my presence (and rightly so). The new surroundings were indeed drastically improved from my last visit a few years ago. They were clever too: Special seating that muffled the sound around you whilst you read a paper (complimentary of course), a business area with plenty of plug sockets to recharge the batteries (again in soundproof areas), some funky lighting, a swish bar and chairs that wouldn’t look out of place in a contemporary art exhibition. But, whilst I was there, I thought I’d use my time wisely, or rather I couldn’t help but still be in work mode and wanted to find out more about the people who worked there, not just take in the new furniture. Well it didn’t take me very long, possibly a whole ten seconds, to realise that they were enthusiastic and by the bucket-load. There was more enthusiasm bounding from them than the amount of volts that power their trains (that’s 25,000 volts AC, in case you are interested). During the evening I spoke to one of the team, ‘Neil’. I couldn’t help but wish that my own organisation was full of Neils. He told me he was immensely proud to say he worked for the company and couldn’t wait to tell people when they asked what he did. He went on to talk about how well the company treats him, how good the training is that he has received, and how supportive managers are. I actually thought maybe he had sneakily been drinking the cocktails they were handing out. I mean, imagine if you could have a whole workforce overflowing with that much enthusiasm? Sadly all too often in local government that is not the case. Neil went on to tell me that he had never thought of working for the company until one of his mates came around for dinner and started talking about Virgin Trains and how he had joined them and what a great organisation it was. His friend said there were some jobs being advertised and he should consider applying. Neil pointed out he didn’t have any knowledge about trains, but persistent in his quest to get Neil to apply, his mate told him what Virgin Trains really cared about was recruiting those with great people skills and passionate about good customer service. It didn’t matter that you have never worked on the railway before, because Virgin Trains is out to deliver a service like no other. Neil was a bubbling bundle of contagious enthusiasm. I thought I’d better speak to some of his colleagues in case Neil was just one of these persistently happy gushing people that always wakes up with a spring in their step. I managed to speak to Graham, who it turned out was one of the managers and had responsibility for the new lounge. It also turned out Graham had just become a father and was actually supposed to be on leave, but committed to the cause, he wanted to come in for the opening night to see his vision of a first class customer experience in action and understandably be a part of it. I’m not sure about how his wife felt about this, but being such a nice guy, I'm sure he has plans to make up for it. By the end of the evening, I wanted to quit my job and beg for a new role there (ok, I had drunk a couple of cocktails by this point, but you get my drift). · There is clearly organisational integrity, how I perceive the brand is exactly what I experienced and it was great. And what is blindingly obvious to me from my last paragraph... those are the four pillars to engagement as described by Engage for Success. It works, folks, I saw it for myself, heard it for myself and experienced it myself. Engaged employees deliver fantastic customer experience. And why? Because they genuinely want to. Getting your employees engaged needn't be rocket science, but that doesn't mean it’s not hard work. If you’ve not heard of Engage for Success, they are a voluntary movement committed to the belief that employee engagement is a better way to work http://www.engageforsuccess.org/about/. It’s a cracking website, with loads of great stuff. Get in there, get using it or as Richard Branson says himself, screw it, just do it! I want to be greeted by and working alongside Neil’s everywhere.